Summary: Boudicca was Queen of the Iceni people of eastern England and led a major uprising against occupying Roman forces. Much of the action took place in the area covered by this walk, hence its name. An alternative approach would be a challenge march of the full 37 miles, returning by train or bus to your start. I opted for two sections and found that Tasburgh is served by the Simonds bus company, including a Sunday service, between Diss and Norwich. Having parked the car at Tasburgh I caught the bus into Norwich and had a look around the city as I walked between the bus and rail stations. 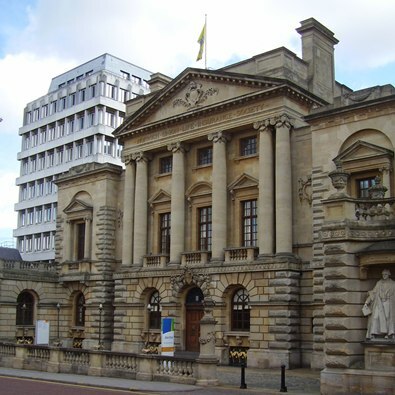 While Norwich Union Insurance may now be Aviva the many office buildings still bear the former name in both stone and iron and will no doubt be perpetuated if the buildings have 'Listed' status. The head office, Surrey House, claims to be "One of the most elegant and opulent Edwardian office buildings in Britain". Thorpe station was the first and now the only rail station to serve the city. It was rebuilt in 1886, no doubt in response to the proposed opening of an upstart trying to usurp its position. 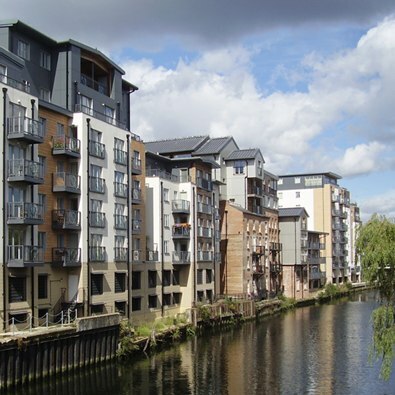 Our walk makes a very pleasant start alongside the River Wensum, my map shows it as a part of the Norfolk Boards National Park which threads its way through the city. The Sea Cadets have a large grey ship here while an ugly wooden structure offers evening meals. Daily river trips are also on offer but no sign of of them today. 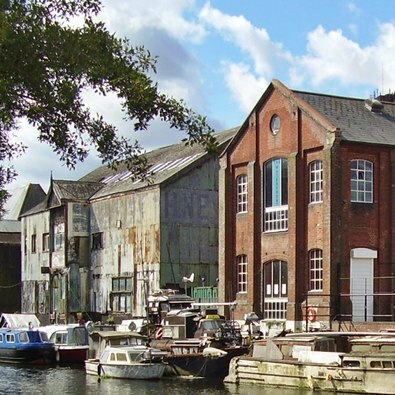 Old buildings and boats sit alongside new apartments and a new bridge. This provides plenty of interest along this all to short section of the walk which is shared with the 'Wherryman's Way'. Carrow Bridge was built to open for boats to pass through but does not look as if it has been called upon to move recently. Here we leave the pleasant waterside to exit the city by road. This must be the only escape route because cyclists on Cycle Route 1 are also required to compete with the traffic. 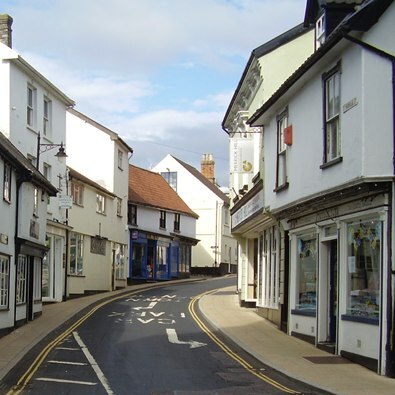 Trowse village offers a shop should you be ready for refreshment and a pleasant row of houses sit opposite the green where children play on this Sunday morning. The Boudicca Way is not well signed out of the city but at the first section of real footpath the first sign appears along with the advertisement for Arminghall Car Boot Sale. It was in full swing today. I was tempted to browse but how would I carry that bargain in my day back pack? After nearly three miles Boudicca Way finally hits open countryside. It's a shame that a riverside walk can't be created to provide a green artery into the countryside from the city centre. 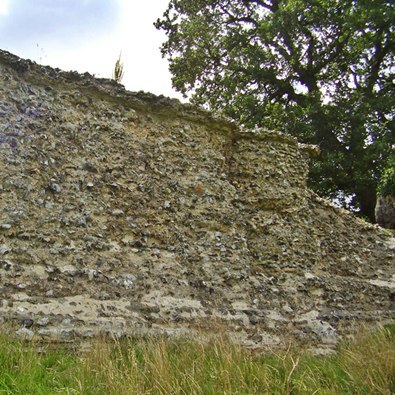 Chalk and gravel is or has been quarried and in earlier times the flints were an important export, our path here detours around a former chalk pit. 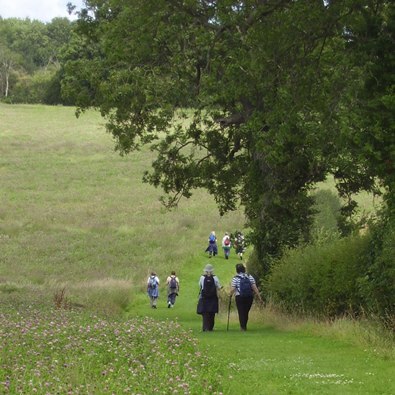 I passed a small group of female ramblers just before arriving at a splendid seat in memory of a lady "who loved these footpaths", they are lovely on wide mown headlands. I paused on the seat for an early lunch. Besides being told where to, it's also made clear to us where we should not walk. I have never seen so many 'No Footpath' signs. I had sought an alternative to the road walk to and from the remains of the Roman Town of Venta Icenorum and now on site find permission paths in abundance provided by High Ash Farm. They are guaranteed until 2016 so after the funding runs out you may need to follow the road but in the meantime enjoy more wide mown headlands which are popular with less dedicated walkers. I did a circuit along the remains of the wall around the Roman Town which added about a mile to my day but allowed time to take in the size of this site which unlike so many other Roman towns was abandoned and hence is better preserved even after plunder of the best stone. On my return a board tells me about an urn found in the Anglo-Saxon burial site close by. As I approached Upper Stoke tall robust metal fencing around a field attracted my attention and around the corner a former guard house had a sign 'War Museum'. 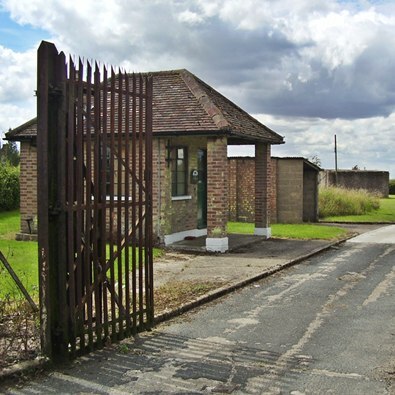 This is the remains of RAF Stoke Holy Cross, part of the coastal early warning radar stations code named Chain Home. Nearby there are two tall radio towers, one is still owned by the Ministry of Defence while the larger 'stepped' tower is owned by BT. The Boudicca Way has recently had an upgrade including a respelling of the Queen's name as my map shows 'Boudica's Way'. 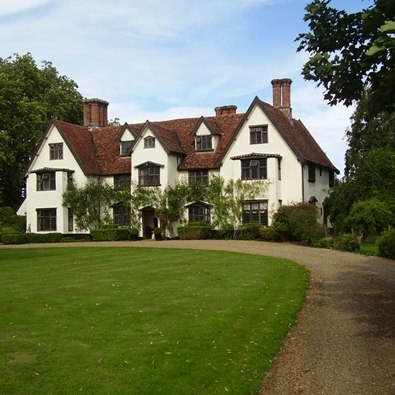 The route has had some small changes and one I approve of is here at Shotesham. I do like to wander through villages as a change from field paths. It's now 1.30pm and The Globe is flat out serving Sunday Lunches. I order a pint of Adnams having seen the hand pump on the bar and the barmaid promptly disappears, to reappear with a full glass of ale, straight from the barrel I suspect, excellent none the less. 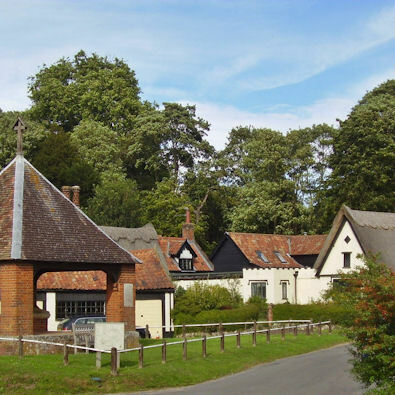 I am still not clear about the feature on the map 'Duke's Head' which sounds like another Inn but is in fact a pleasant house with Dutch gables standing opposite the church and creating a pleasant village scene. The church is worth an internal inspection to see the uncovered wall paintings. I'd spotted another church alone in the fields and adjacent the remains of St. Martin's so I stray from the Way to explore and investigate other Norfolk paths. The paths were excellent and well walked and the churches proved worth a visit. The tower of St. Martins had until 2009 been covered in ivy but was now standing proud for all to see after locals had a major clean up. I pass couples with dogs, families with children, not serious ramblers, just out enjoying a walk. The lane through Saxlingham Green is pleasant with cottages set well back beyond wide grass verges or perhaps even scattered on the Common. 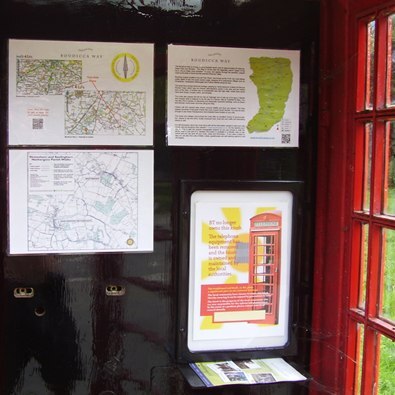 The red phone box is newly painted but the telephone has gone and the wall is now covered with lots of information, about the Boudicca Way. Approaching Saxlingham Nethergate raised voices from the cricket field praise a good catch or run while at the church a Flower Festival is open for visitors, another quintessential English village. 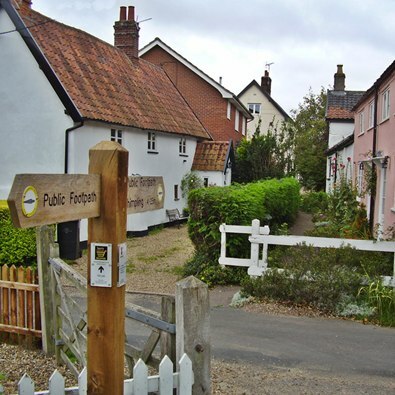 If you choose to stay here there are some lovely holiday cottages in the village. The old map shows the Way straying from the footpath as I approach the A140 but today we are directed along well mown fenced paths between fields full of horses. This I discover is a Redwings Horse Sanctuary which is the largest horse sanctuary in the UK with over 1100 horses, ponies, donkeys and mules in its direct care on farms such as this. Lower Tasburgh has some thatched buildings along Saxlingham Lane. 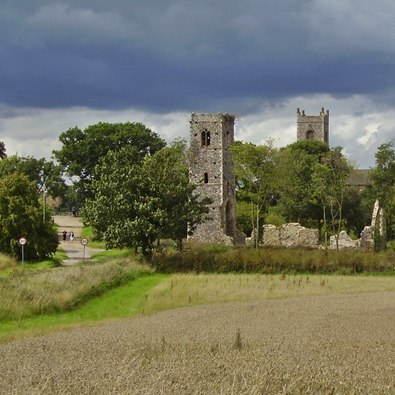 I am attracted by the round towered church, a feature of many Norfolk churches and cut off across a field which I discover could have been settled as far back as 9000 BC while another sign claims it as Iron Age (500 - 50 BC). 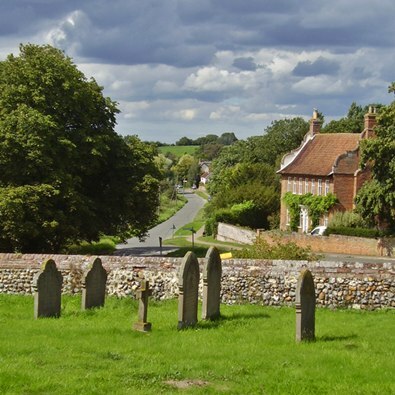 I rest on an abandoned bier in the churchyard to empty the lunch box before strolling back though the new houses of Upper Tasburgh to the car. Having arrived by bus from Diss I start today's leg of the walk along the lane towards Hempnall then take what must be a permissive unmarked track passing Keepers Cottage. The map shows gravel workings but they are unseen beyond the tress and bushes. 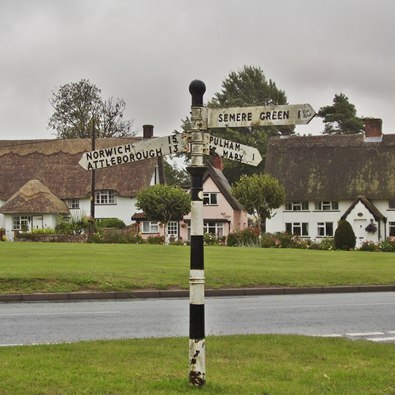 The Way just touches Fritton where a seat offers comfort for a coffee stop and I survey the traffic on the parallel roads to decide which offers the quieter walk alongside the Common. There was nothing in it so I stayed with the route thinking it a shame that a mown path across the Common was not provided for those without a car. There are some lovely sections of hedge lined paths, almost tunnels with overhanging trees and buses but with more than adequate path width and height. 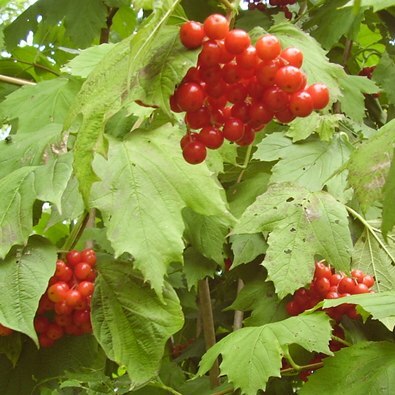 The restricted daylight must also subdue the vegetation as the paths are clear and a pleasure to use. More areas of Common add to the delight of the countryside which while not having many WOW moments is ever changing with crops, grass, woodland and buildings. Tyrrel's Wood part of the Woodland Trust estate provides a maze of paths and it's here that I see the only other walkers of the day. 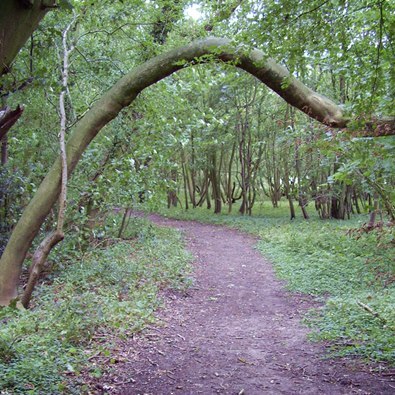 Our route diverges from the Definitive line picking a way to the car park from the labyrinth of paths so take care at the frequent forks and junctions. The paths were dry and firm today but boardwalks suggest it can be soft going. 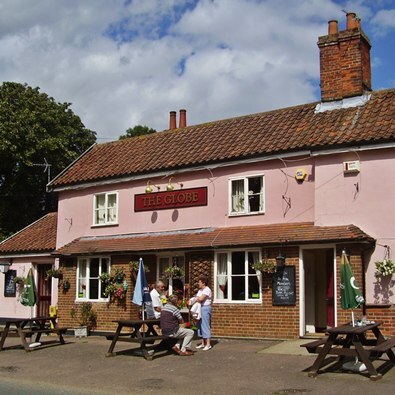 As I approach Pulham Market the timing is about right for a late lunch so I look forward to a pint and hope that midday closing is not the norm here. Passing the smart grounds of the Bowls Club I enter the village along a pleasant path trapped between cottages with a fine view of the church. This passes The Old Bakery, now a B&B to emerge onto the square village green where the Falcon and Crown Inns face each other defying me to enter the 'wrong' hostelry. While I partake in a pint of Woodfordes Wherry, again from the barrel, it starts to rain so I drink slowly hoping the shower will pass before I step outside. I defy the light drizzle and avoid donning waterproofs as I set off along Station Road, what station I ponder? Well it does make it's presence known with a signal and crossing style gates but tall close board fencing spoils the appeal. I misread the sign 'Pulham Market Hall' putting the pause after Pulham, forgetting the town's full name, but it's commercial premises with Banqueting Hire services and Fitted Kitchens on offer so perhaps it is Pulham, Market Hall. Like London buses there is no pub for miles then three come along and the third is the 'Old Ram' a coaching inn on the main road. Sweet peas, Buddleia and blackberries make up the hedgerow as I skirt Tivetshall St Mary onto a 'Quiet Lane' which is a formal definition here in Norfolk. 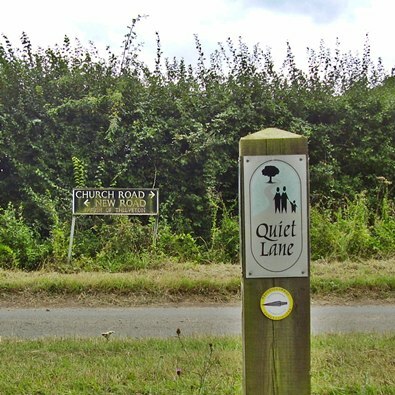 The idea of Quiet Lanes, is to get people to use more appropriate routes and adopt a 'share with care' philosophy. This approach should make minor rural links better for road users, including walkers, cyclists and horse riders where they provide links to the public footpath and bridleway networks. Certainly without the linking roads it would be impossible to create a walk such as the Boudicca Way. Shimpling has two informative boards on the roadside, one showing the parish paths and the other a wealth of local history so I stop and take stock before moving on the the church of St George. Like many other churches along this walk this one is no longer needed for regular worship and is cared for by The Churches Conservation Trust. 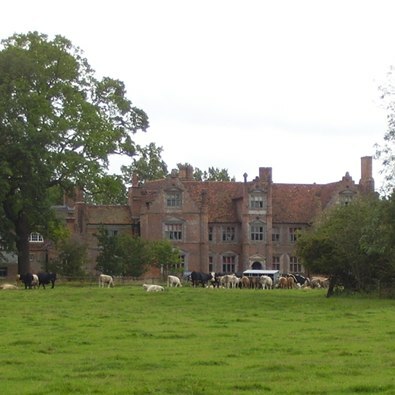 Had I been walking south to north I may have missed the view of Chelveton or Thelveton Hall built towards the end of the 16th century of brick with two storeys and attic, it's worth a glance back if your destination is Norwich. 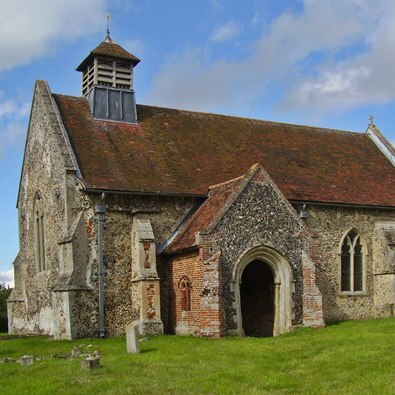 Inside the small church we learn a little more about the Thelveton Estate and its owner Thomas Mann, from the brewing family, who died when he fell with his horse in 1886. 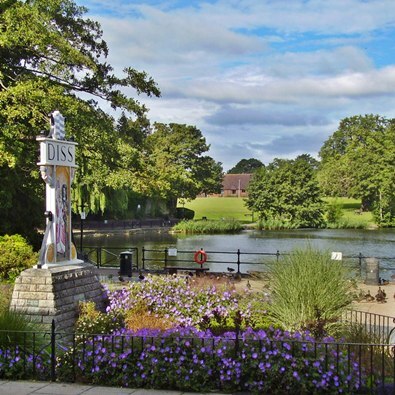 We are now approaching journey's end and a sign suggests the Way ends at Diss Mere which would in my opinion be a far better finish rather than the railway station located some distance from the town's centre. One last building of interest and another church, like many in this area it has no obvious village to serve but then Frenze Hall would have been a busy community in days gone by. 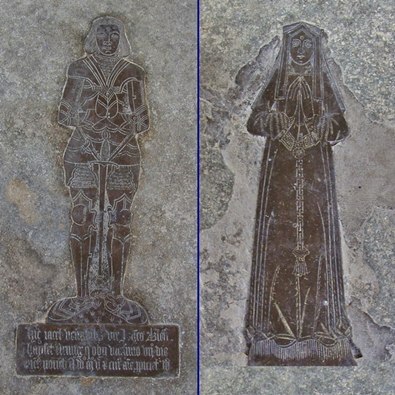 Some non-pillaged brasses to study plus the family box pew, worth a peep inside the door. 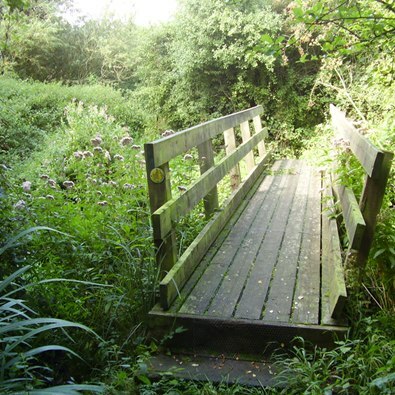 We join the Angles Way and I am relieved that EMAP volunteers installed a bridge as the ford, even with little recent rain, looks too deep for dry passage without wellies. More new houses are extending Diss along Frenze Hall Lane let's hope these don't turn their backs on the lane like the last development. 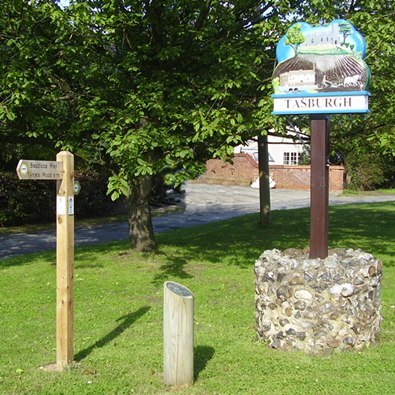 Fortunately I'd arrived earlier in the day with time to spare before the bus took me to Tasburgh so I had time to explore the town. Set sort of around the mere and with a sort of traffic free high street it has many attractive buildings and manages to retain some vibrance so often lost in these small market towns. A great end to the walk if you ignore the the instructions to finish at the rail station, which I never managed to find. Report and pictures by Ken Brockway.